¨Parents often complain about their children watching too much TV, or spending hours on their PC or mobile phone. But what else is there ? Is there any single activity where students can learn to compete + socialise + develop useful academic skills ? Yes, there is … and it encompasses a myriad of primary school subjects ! All of this is possible via numismatics and/or notophily (coin and/or banknote collecting). For example, Irish coins and banknotes in the past 100 years show 3 different currencies ! Why did Ireland have 3 different currencies from 1928 onwards? What was the ‘face value’ of each of the 8 coins ? How many of each coin was in one pound ? Why did we wait until 1928 to issue our own coins ? What coins did we use between 1922 and 1928 ? Where were the first Irish coins made ? Where were these ‘new’ decimal coins made ? How many euro equals one Irish punt ? How many Irish punts in one euro ? Why did Ireland go Decimal in 1971 ? What animals were on the designs of the first Irish coins ? What was the name of each coin in Irish and in English ? How did the new decimal coins differ from the older coins they replaced ? Why did Ireland introduce a 20p coin in 1986 ? Why did we make the 10p and 5p coins smaller in 1992 and 1993 ? Why did we introduce a new one pound coin in 1990 ? How many other European countries did this ? What was the ‘fixed’ conversion rate into euro for each of these currencies ? What are the names of these countries “as Gaeilge” ? What are the names in their official languages (as shown on their coins) ? Why does Belgium have two versions of their country name on their coins ? What non-EU countries also joined in 2002 ? What currencies were they ‘tied to’ before 2002 ? What are the names in their official languages ? How many EU countries have joined the Euro since 2002 ? What was the national currency of each country called ? What other countries have applied to join the Euro Zone ? Global Sporting Events such as the Olympic Games, World Cup (hockey, football, rugby), etc. Even if your child doesn’t get past this beginners and improvers stage, they will have learned quite a lot about their world and how it works. If they do make it past these initial stages, they will probably collect for life and continue learning for the rest of their lives too. Every major city in the world has coin and banknotes dealers, and they all have collectors fairs and exhibitions, so travelling takes on a whole new dimension for the collector. 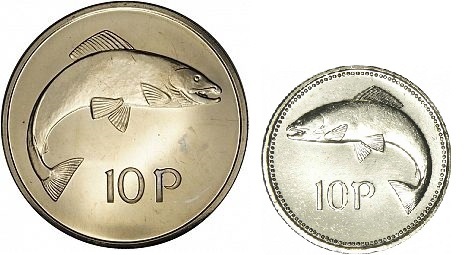 There is an old Irish myth about a boy who ‘tasted the salmon of knowledge’ and this fish featured on the Irish pre-decimal florin and the Irish decimal 10p coin. This might be a good metaphor for the benefits of collecting and studying coins as a child. The Salmon of Wisdom or Salmon of Knowledge (bradán feasa) is a creature figuring in the Fenian Cycle of Irish mythology. In Welsh mythology, the story of how the poet Taliesin received his wisdom follows a similar pattern. Irish Metal Detectorists: Saints or Sinners?